This is the perfect, easy, fresh, tasty meal to make on the weekend, or during the busy work week, when you’re craving some yummy take-out and the convenience that comes along with it. This is one of our go-to meals, it’s quick and completely customizable. As long as you have some noodles, and rice papers, the rest is up to you (and whatever you’ve got chillin’ in your fridge). I’ve been meaning to post this for a few weeks now, and my sincere apologies to a special person out there who so kindly requested a recipe after seeing me post a picture of it on Instagram! I’ve never written down my measurements when making this, it is usually just a pour, pinch, and dash free-for-all into a pot. Also I was holding off for some better photos. After three different attempts making this and trying to photograph it, each occasion presented a new dilemma… and I finally gave up. It started with my daughter having a bad evening and needing to be held (try to take pictures holding a two year old howling into your ear..it’s just a bit of a challenge! ), then my kitchen remodel started (bah! no countertop to roll my rolls! ), and then the worst thing.. the corner of my memory card snapped off, and I couldn’t find a replacement for it anywhere! So, the new photos did not happen. 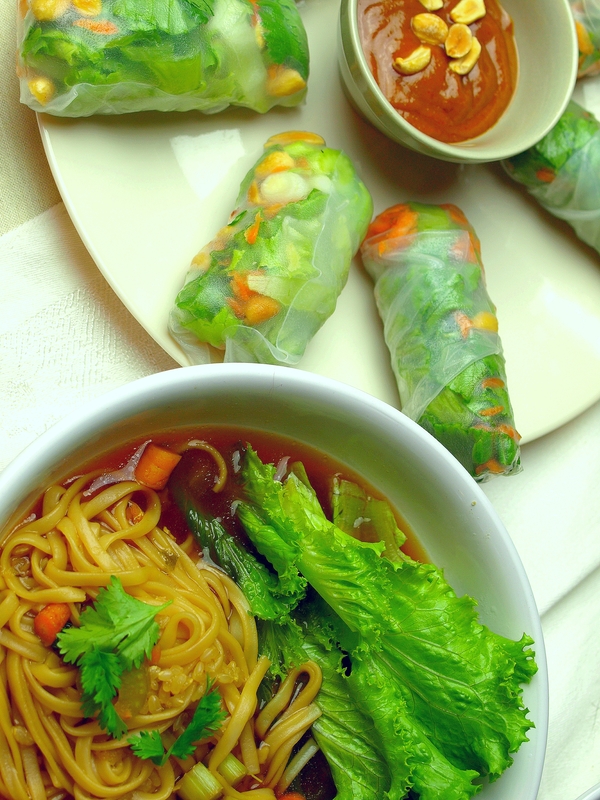 Hopefully these pictures will suffice, and you’ll take my word for it that these noodles and rolls are just as yummy (and certainly a whole lot better for you) than most anything you could get at a restaurant. We used to get Thai take-out every single Friday evening. Without fail! Now that I have a few quick Thai, Vietnamese, Japanese, and Chinese inspired dishes up my sleeve, I find I like to stay in and cook up something a little healthier. I first came up with the noodle soup when I was craving some Japanese-style udon noodle soup. Since I couldn’t find a restaurant in town that had anything of the like, I had to make my own. 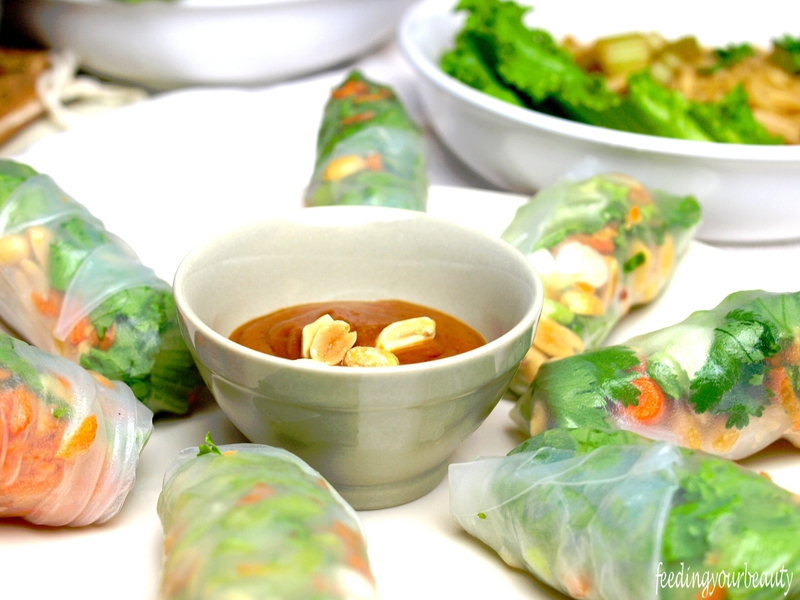 I added the spring rolls to the meal because we just love these, and once you get the hang of it they are pretty easy to make. You can change up the ingredients, add in different herbs and spices, flavored oils, switch up the dipping sauce… there are so many ways to make this your very own! I’ve included my suggestions below, but have fun with it, the sky’s the limit! Or use what you have already, this is a great meal to use up veggies that you maybe bought too much of, or some odds and ends you want to clean out. The next time you find yourself digging around the junk drawer for that take-out menu, make this Asian-inspired “stay-in” meal instead! Hope you enjoy this one as much as we do! whatever else you would like! This part takes a little practice, but it’s kind of fun! My biggest mistake I used to make was that I used to worry about dabbing the wet rice paper with a towel, which you don’t need to do. Nor do you need to roll them on top of a towel, which I find impossible. That extra water is necessary for softening the paper. Instead, use a wooden cutting board and wet your rice paper in warm (not hot) water for a few seconds and then take it out while it still seems firm and lay it down wet on your wooden cutting board. As it sits there, while you add the fillings, it will absorb the water and become soft and pliable. Add your fillings to one half of the wet rice paper. Pull the end that is closest to you over your fillings. Fold over the right and left ends. Roll away from you, holding the fillings in and trying to keep it as tight as possible. Mine aren’t perfect! And I still have some total flops. But as long as the fillings are tucked in there, it’s all good. Serve with your favorite dipping sauce. There are some great recipes online if you want to make your own, but in a pinch we use San-J Peanut Dipping Sauce. In a large stock pot, bring the broth and soy sauce to a boil and add the ginger, garlic, and veggies of choice and simmer until veggies are tender but still crisp and bright in color. Divide your cooked noodles between your bowls, and pour the hot soup over top. Add in flavors and toppings of choice and enjoy! Alternatively, you can begin by sauteing the garlic, ginger, and firmer veggies (i.e. mushrooms, carrots) in a little bit of coconut oil. After a few minutes, add in the broth and soy sauce and bring to a boil then reduce heat and simmer, adding in any other optional ingredients (i.e. miso, cabbage, spinach). Simmer until all veggies are tender-crisp. Divide up your noodles, and pour the hot soup over them. Top and enjoy!